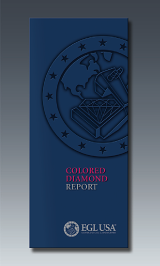 The Colored Diamond Report captures the unique characteristics of diamonds distinguished by hue, tone, and saturation. This report contains all of the classic diamond report measurements. Plus, it includes color-specific criteria such as absorption spectra, color distribution, color grade, and color origin. Colored Diamond Reports are offered in a variety of styles, and are also available for colored diamond jewelry.